The pilot scheme, which was launched on Friday 19 December by Police and Crime Commissioner Martin Surl, is being rolled out in an attempt to patrol the regions large geographical area, whilst remaining eco-friendly and efficient. A2B is – the leading international e-bike producer whose performance, quality and reliability makes for one of the most stylish and versatile e-bikes on the market. The model being assessed in this scheme will be the highly popular Hybrid 24. Built with stability in mind, the bike will ensure a seamless ride as the rider tackles the hilly terrain synonymous with Stroud, whilst raising the profile of the Neighbourhood Protection Team. The bikes were purchased from eCycle UK, based in John Street in Stroud, who have the largest selection of electric bikes in Gloucestershire. The use of e-bikes within police forces is a trend currently taking off on an international scale, with the benefits of speed and environmental awareness high on the agenda. 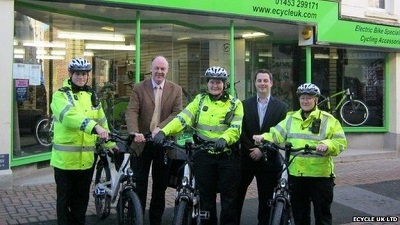 A2B General Manager, Fernando Kuefer, said: “A2B is renowned for being the industry leader in e-bike design and technology, so we are delighted to be working with the Gloucestershire Police in launching this new scheme. For more updates from A2B follow @weareA2B.